These are like a boozy Christmas version of a Jammie Dodger, and I’m sure Father Christmas would be very happy if you left one out instead of a mince pie. Brandy or Baileys works just as well, although amaretto remains my favourite. 1. Preheat the oven to 180°C, gas mark 4; line 2 large baking trays with baking parchment. To make the biscuits, pulse the flour, salt and sugar in a food processor a couple of times to combine. Add the butter and process until the mixture resembles breadcrumbs. Add the egg, egg yolk and vanilla bean paste, and pulse a couple of times to start to bring the dough together; try not to over-process the dough. 2. Tip the dough onto the work surface and gently bring it together with your hands until smooth and uniform. Divide into 2 pieces and press each out into a disc. Wrap separately in cling film and chill for 1 hour, or until firm. 3. On a lightly floured work surface, roll out 1 batch of dough to 0.3cm thick. Using an 8cm cookie cutter, cut out as many biscuits as possible; set the offcuts aside. Place the biscuits onto the prepared baking trays and repeat with the second batch of dough. 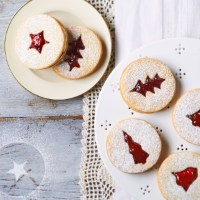 Using a small seasonal cutter – such as a Christmas tree, star or holly leaf – cut out a shapein the middle of 1⁄2 the cookies; these will be the tops. Roll all the offcuts into a ball, flatten into a disc, wrap in cling film and then chill until firm. Roll out, shape and cut as before. 4. Bake the biscuits for 10-12 minutes or until very lightly browned around the edges. Leave on the baking tray for 5 minutes before cooling completely on a wire rack. At this stage, the biscuits can be stored in an airtight container for 7-10 days. 5. For the buttercream, cream the butter in a large bowl, using electric beaters (or a freestanding mixer), until fluffy. Gradually add the icing sugar a little at a time, beating until all has been combined. Turn the mixer to high speed and beat until the buttercream is light and fluffy. Add the amaretto and mix to combine. 6. To assemble the biscuits, spoon or pipe a layer of the buttercream onto the bases of the cookies and place about 1 level tsp of jam into the centre of each. To finish, gently place a cutout biscuit onto each bottom and press together until the buttercream is just peeking out of the sides. Dust with icing sugar, if liked. Freeze the biscuits and buttercream separately for up to 1 month. Reheat the biscuits from frozen at 180°C, gas mark 4, for about 3-5 minutes, then cool on a wire rack. Defrost the icing at room temperature for 1-2 hours until thawed, then decorate the biscuits as per the recipe.